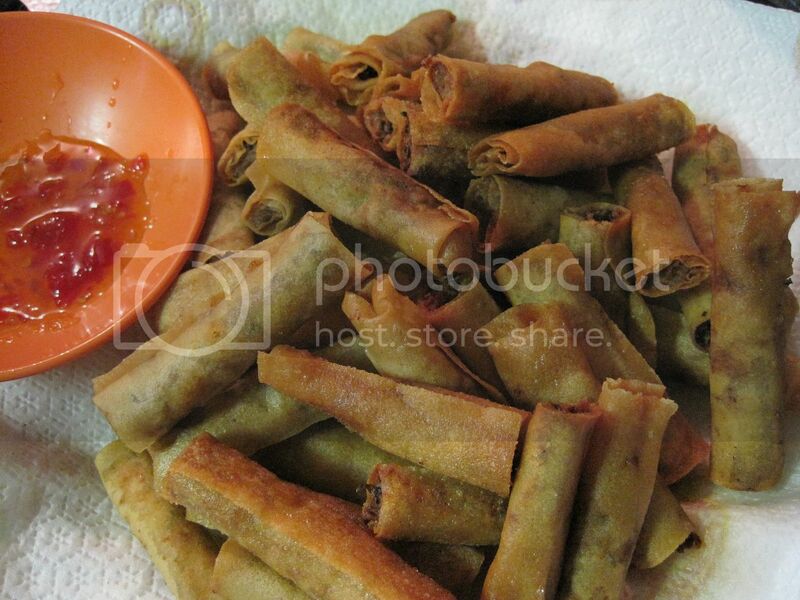 Let me come right off and say that this is not ‘authentic’ or the traditional Filipino way of making lumpiang Shanghai. Although I have mentioned on my About page and elsewhere on this blog that I do not cook anything ‘authentic’ but rather a mish mashed fusion of every food I have ever tasted or heard of. So just so we’re clear, this is NOT YOUR MAMA’S LUMPIANG SHANGHAI, this is THIS mama’s lumpiang Shanghai. If you’ve ever been to a Filipino gathering or to a Filipino restaurant, you will discover we have at least three types of eggrolls that I know of. One is the fatter roll with vegetables in it and the third one is more of a crepe or a spring roll in that it has a crepe like wrapper (not fried) and filled with meat and vegetables. This one, is filled only with meat except for the aromatics and almost always is rolled petite and skinny like compared to the other lumpias. My daughters and I made shumai with this mixture the other week but we had more meat than wonton wrappers so I decided to wrap these up the skinny way, fry them up and call them Shanghai! To wrap, I use the thin kind of wrappers. They are labeled ‘spring roll’ wrappers and are usually found in the freezer section at the oriental market. When you’re done wrapping, you can either freeze the lot at this point or fry them up. These were served with a hot, sweet & sour dipping sauce. *To re-hydrate dried shiitake mushrooms, soak them in hot water for about 30 minutes until they become soft again. I like YOUR Mama’s lumpias Jmom! 🙂 I am sure the addition of shitake mushrooms brought this to a whole level of awesomeness. I like any kind of eggrolls. These sound yummy and I know how much work they are to make. Good for you to find an easy way to make them.